As a shopaholic, I adore summer sales and any sale in general. However, when you're shorter on time, it's sometimes hard to browse through endless rails or have the patience to do so either. 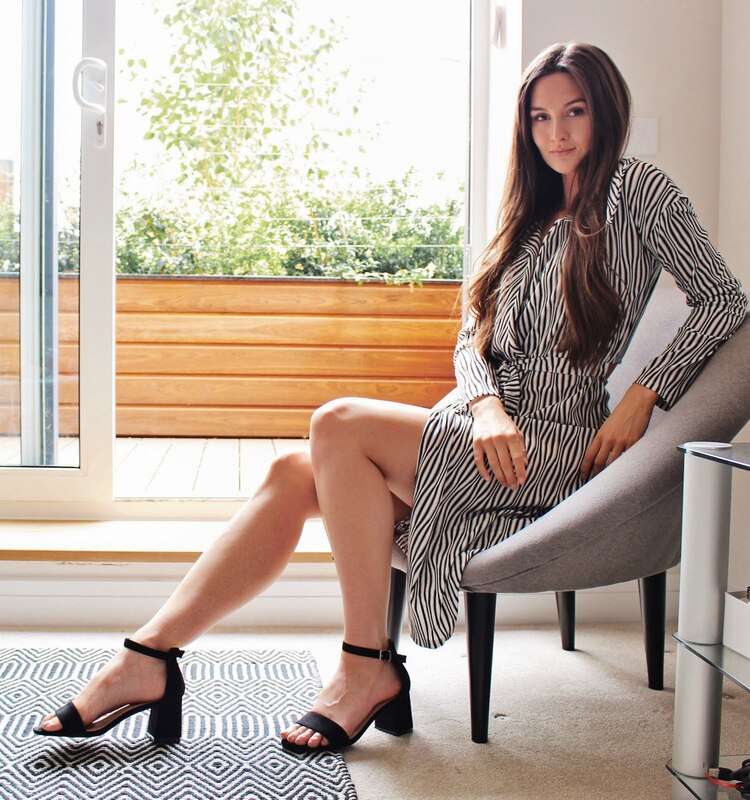 I've created a little shortlist of tips to help the sale rails appear less daunting, and to aid you in finding the best pieces for your summer wardrobe whilst being on a budget! I actually first saw this dress on the online Zara sale, but with little funds at the time, I left it abandoned in my basket. Shopping the sale in-store, I kept an eye out for the dress that I knew I had my eye on, and by chance, it was there. I prefer to try things on before I buy, because a lot of things now just aren't how they appear online or they don't fit me how I would want them to. However, not everything online will be in-store, so it's always worth checking both. I often find when a sale is first announced, it is best to be one of the first people looking at it online. Whether its on your commute to work, or on a chilled evening at home, you have to be committed if you want to make the most out of the sales. The convenience of online shopping also helps, as you don't even need to leave your house now to get something new for your wardrobe, so really, there isn't much commitment at all, you just need to beat other people to it! Sale rails are stressful for everyone, because no one seems to respect them enough to keep them tidy! Although sales assistents try their best, I can tell you from first hand experience, when it's busy, it is impossible to keep a sale rail looking on point throughout the working day. This is why, if I am shopping in-store, I like to be an early bird and get there while it's tidy and the shops are pretty much deserted. I find the best pieces, in my own time, and I don't need to hunt through piles of clothes on the floor or queue for the changing rooms! In general, I try to stick to this tip when I am shopping. You must remember that stores, shops, and supermarkets are designed to tempt you into buying extra things that you often don't need. To avoid this, keep a check on your budget and don't be tempted by the products lined up by the till unless you actually need them. This is more of a recent tip that I have established. As a child, I never ever wanted to try things on, because I found it boring and most things fitted me anyway. However, since my body type has changed and from dropping a few dress sizes, my size seems to vary between shops. I am actually not 100% sure by any size, I have to just try it on these days and if it works, it works, and if it doesn't then sadly, it can't come home with me. If you're rushed for time, I understand that sometimes its not feasible to try everything on. That is why you must always check with the sales assistant what their returns policy is. It varies between shops anyway, but some stores have different policies for their sale items also. Shoutout to Topshop for keeping their sale returns the same as normal with your receipt and sending the money directly back onto your payment card. No thank you to that credit note or exchange only! FORGET IT'S DISCOUNTED, WILL YOU ACTUALLY WEAR IT? I am still training myself on this one, and I'm improving I must say! I am quite limited on space, and I try to be sensible with my money, but every one knows that I love clothes. In the past, I've often bought things and not been 100% in love with the item, or I have bought it and never felt confident or comfortable enough to wear it. It is such a waste, and therefore now I will only buy something if it wows me and I know that I will wear it! Don't be fooled by a good deal, it may be a huge discount but its not a good deal if it doesn't benefit you and if you don't ever wear it. Often a lot of shops still offer student discount on sale items, so if you have it, make sure you ask and make the most out of it while you can! There you have it, my favourite tips for getting through the summer sales. If you have any tips that I haven't mentioned, be sure to leave a comment below & I'll add them to the list! Happy shopping all! EVIE ROSE LANE © . Design by FCD.